Alabama hosts Michigan, Denver and Bowling Green in a quad meet that is sure not to disappoint. It’s the second quad meet in as many weeks for both the Crimson Tide and Wolverines, both of whom will be eager to improve on last week’s performances. Meanwhile, it’ll be our first look at the Pioneers and Falcons who open up their seasons tonight. Alabama is coming off of a quad meet win, but with a score of 194.750 the Crimson Tide look to improve. The team was mainly held back in week one due to beam, tallying just a 47.700 after two falls and tight judging in regards to the new beam pause rule. The talent is there—and it’s just the start of the season—so look to see if the team can improve upon this total tonight and in weeks to come. Shallon Olsen and Emily Gaskins lead the Alabama freshmen while upperclassmen like Wynter Childers, Lexi Graber and Ari Guerra are ones to watch as well. 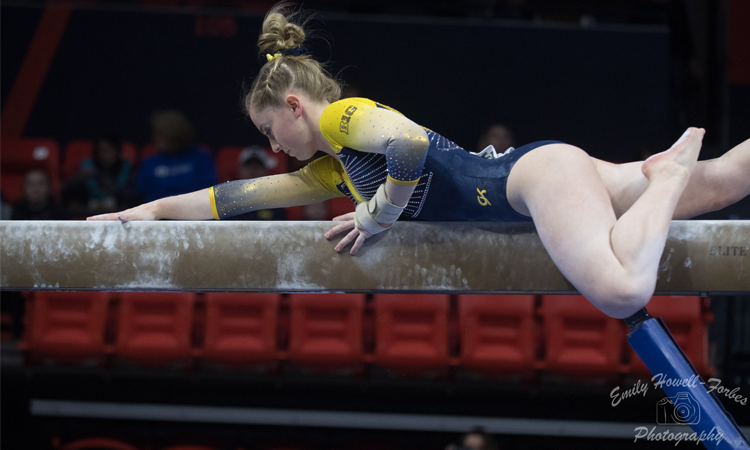 Michigan also had its share of mishaps at the Cancun Classic, rebounding from a shaky start on beam that consisted of the first two gymnasts falling to tally a 196.050 overall. With Alabama also having struggled last week, this meet could easily come down to who can put up the better number on beam. Watch for freshman Natalie Wojcik who had a breakout first meet that included scoring a 9.975 on her Yurchenko one and a half. Her classmates poses similar star power and will impress as well. Olivia Karas has also returned, competing vault (only a Yurchenko full), bars and beam in her journey back from an Achilles tear. It’s our first look at Denver in 2019. The Pioneers lose just three routines from 2018 while gaining a freshman class that includes Alexandria Ruiz and Alexis Vasquez. Expect Maddie Karr and Lynnzee Brown to lead the way in the all around for the Pioneers while Mia Sundstrom should compete in the all around as well. Courtney Loper is back after missing most of 2018 for unknown reasons. According to tentative lineups, we can expect to see her on beam and floor. With this in mind, the Pioneers are poised to be a deeper team in 2019 than they have been in the past few seasons. 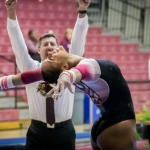 Beam cost the team a berth to nationals last season; with new faces, can it fare better on the event in 2019? Vasquez will certainly lead the way on the precarious event, and Kaitlyn Schou won’t disappoint on the event either. 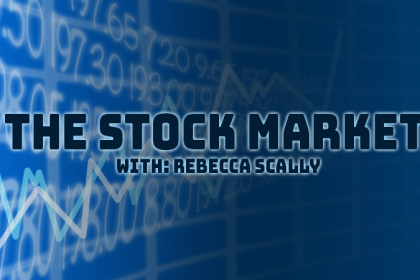 Watch to see how the lineup plays out tonight, especially with what we know about Alabama beam last week. Bowling Green also kicks off its season tonight. Jovannah East will lead the Falcons in 2019 while the team’s freshman class should soften the blow of some of the team’s losses from 2018. Of the freshmen, Tess Muir is slated to compete vault, beam and floor, Katelyn Goldstrom is expected to compete on bars and Paige Bachner is likely to compete floor per Bowling Green’s meet preview. Classmate Anna Maria-Kanyai’s status is unknown—she was seen in a boot in late-December. Especially watch for the Falcons on floor, where their choreography never disappoints. The meet is being streamed on SECN+ if you’d like to follow along, and live stats can be found here. East – 2.5 to lay good — so much power! looked like she was close to OOB; did a side pass too, a front 1.5; again loving the choreo; great last pass! this is why she’s their anchor. So. Good. A little bit of a shaky start for BGSU on floor. Bama started well on vault and is currently in the lead. Denver had a very solid beam rotation to start its season and Michigan had an ok start as well. A little 9.7y for the Wolverines. Competition between the top three is TIGHT. Just 0.25 is separating Denver from Alabama and Michigan is just 0.025 above Denver. Beam scores are definitely erring on the low side once again in Tuscaloosa. Another good bars rotation for Bama. Vaults looked good for Bowling Green from what I saw, they’re definitely making use of what they have! Michigan will be proud of this beam performance after last week, even if the scores are lower than you’d expect for an SEC meet. Denver had another solid rotation on floor. They’ll want to work on getting some of those landings nailed down, especially in the lower half of that lineup in order to boost their scores. Here’s MIchigan’s Floor lineup. KARAS IS BACK. I repeat, KARAS IS BACK. Bowling Green’s bars lineup: Kanyai is back! Aside from Ruiz, Denver looked good on vault for the first meet of the year. Bowling Green had a ROUGH go of it on bars and only scored a 46.2 on the event. And Michigan looked good on floor from what I saw, just some form issues and short passes here and there were keeping them down. One more to go in Tuscaloosa! McLean – just does the full, but it’s a beautiful one! flaired and all. Wojcik – another gorgeous 1.5 from her! We’ve got an upset in Tuscaloosa as the Pioneers take this one! Super close between Denver, Michigan and Alabama but the Pioneers ultimately came out on top. Scores were a little tight throughout the meet, maybe this is becoming a Bama trend? What? An SEC team with tight scoring? I just counted. Only 5 scores over 9.9 for the entire meet. Definitely a rough meet for Bowling Green and lots to improve on for the Falcons. Michigan turned in about the same performance as last week but I think they’ll be happy with the improvements on beam especially, even if it’s not reflected in the final score. 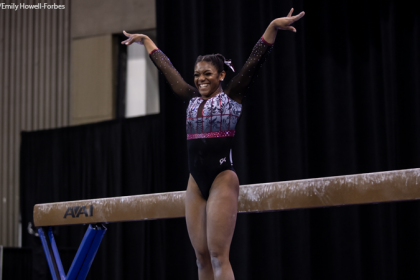 Bama still definitely had its moments on beam, but again still improved from what I saw last week. 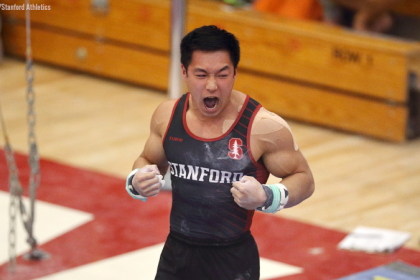 Denver remained pretty consistent throughout the meet and used its final rotation on bars to seal the deal. There’s definitely some small things the Pioneers will want to improve over the season but it’s only the first meet and it’s definitely a great start to the season for them. A Twitter Moment of the meet can be found here.